Tips, tricks, pictures, videos and reviews of the Tomy/Takara i-SOBOT. The world's smallest mass produced humanoid robot. Would you like to get an E-mail notice whenver I add news to the i-SOBOT blog? Subscribe using this form. Pictures, Videos, and more Information on i-SOBOT. 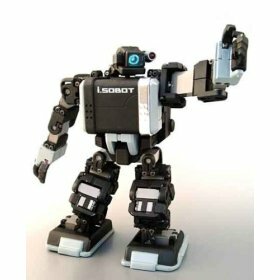 "The initial production lots of i-SOBOTs currently being delivered to customers use flash ROMs. Tsukumo speculates that some daring customers might be able to re-flash the ROMs to modify the i-SOBOTs sounds and other functionality. The follow-on production lots will switch to non-flash ROMS." Note: reprogramming an i-SOBOT entails opening and disassembling him in away that is not for anyone who isn't a complete expert, and also doesn't mind risking the destruction of their unit. Even if the hack works, it's guaranteed your warranty will be voided. I love the idea of hack like this but I personally won't attempt this. If I break him, who will operate my Chumby computer (see video below)? i-SOBOT : World's Smallest Chumby User! I recently got my brand new Chumby touch screen computer. Before I even got to play with it my i-SOBOT robot took ownership of it and started playing with it first! In this video you can see my i-SOBOT robot having a little dubious robot fun poking away at the Chumby "Eyeball" widget, created by widget author dmaxwell. Apparently the eye is too much for i-SOBOT and freaks him out completely! I guess I found out who the real user demographic is for the Chumby computer. Lem at Robots Dreams, one of our favorite robotics sites, has just posted about the white i-SOBOT. The white i-SOBOT is intended for Japan while the black i-SOBOT is for the USA. In his post he points out that the black and white i-SOBOT's are functionally identical, except for the color and the language that i-SOBOT speaks and recognizes. There are minor differences in the packaging but in both cases it's incredibly easy to remove i-SOBOT from his box. There are no straps, ties, or glue. You just open the box and pull i-SOBOT out! The only tool you need is a small screwdriver, and that's only for taking off the breast plate so you can insert the Eneloop rechargeable batteries. As usual, the post is packed with great high quality photos. Best of all, it shows a thumbnail of the upcoming winter issue of Robot Magazine, which features the i-SOBOT robot and another fantastic article by Lem. Robot Magazine, especially this issue, is a must read for any robot fan. Spoiler Alert: do not watch this video if you want to find the hidden movements yourself! The video does not tell you what the codes are to make i-SOBOT do the hidden moves, but it does show you the movements. YouTube user AlphA202303 has posted a video that shows 8 out of the possible 13 movements that are hidden in the i-SOBOT robot (not documented on the reference card or the manual). i-SOBOT Fight Club : The Shocking Truth! The wonderful news of Takara/Tomy's amazing i-SOBOT robot's recent arrival on USA shores, has been blackened by a deep and dark secret that we at RobotsRule are the first to uncover. We predicted that i-SOBOT, with his amazing humanoid movement and combat skills, would foster a huge wave of friendly competitions throughout the world. Our prediction has come true but sadly with a troubling sordid twist. i-SOBOT "fight clubs" have begun springing up throughout the USA where hapless i-SOBOT's are forced to fight in vicious pit matches with lethal and primitive creatures; solely for the dark pleasure of fat grubby humans (like myself), who wager on these matches. In dusty dirty basements found below abandoned warehouses the tiny robots fight for their very survival against hopeless odds. Tiny Toad, our fearless intrepid reporter managed to infiltrate one of these clubs wearing a wireless camera and microphone, and film a training session. But even more breathtaking is the live footage Tiny Toad captured from a real death match. This was no ordinary death match. Showing no lmit to their depravity, the hosts for this brutal match managed to capture none other than the terror known as Godzilla, and force poor i-SOBOT into a no holds barred battle for supremacy. At RobotsRule we recognize that it is our obligation to bring this to the attention of you, our loyal reader, and to the world at large. Although the moral and responsible thing to do would be to use every resource at our disposal to stop these vile matches, that would impact our readership. Instead we have chosen to take every slimy opportunity we can to exploit this shocking new development to its fullest potential. Remember. The first rule of i-SOBOT fight club is that you do not talk about i-SOBOT fight club, unless it's funny! NOTE: The following video footage and picture gallery are not for the squeamish or the faint of heart. Be advised! Pictures - Click on any picture to see it full size. A strong right cross to the body. Stiff left jab to Godzillas jaw, pow! Tiny Toad sneaks an interview with i-SOBOT. Tiny Toad seems more concerned with the money than i-SOBOT. Tiny Toad was caught web handed taking a bribe to keep quiet about i-SOBOT Fight Club. RobotsRule is very disappointed by this behavior and absolutely does not condone the taking of bribes unless we get our percentage!